Our Awesome Eagles, "Making the Pledge!" The Alcohol and Drug Abuse Council of the Concho Valley has sponsored a prom pledge for TLCA. Students filled out pledge cards promising to be drug & alcohol-free on prom night. Those cards were entered in a drawing for a male & female junior or senior. 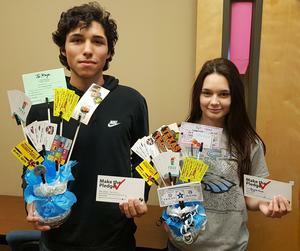 Abryana Pruitt & Isaac Gonzales won. The prizes included gift cards to Texas Roadhouse, Stripes Car Wash, nail salon, hair salon, $25 cash, $25 gift card to Wal-Mart, etc. About $200 in prizes total. We are so proud of these kids! Way to go Eagles!! !